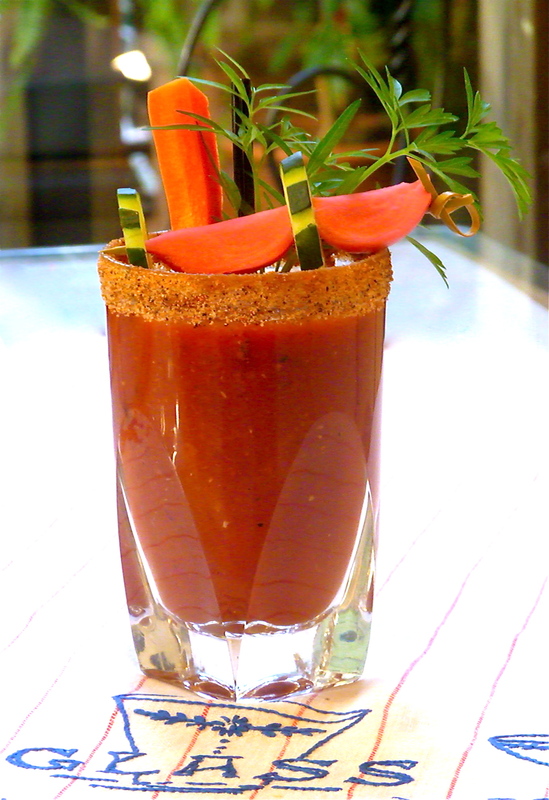 I created a Creole Bloody Mary just in time for the Super Bowl to honor New Orleans. I have spent a lot of time below the Mason Dixon line. My great grand father started the athletic department at UNC and I still have family in North Carolina. I have some close friends in Alabama and love spending time on the beach in the gulf. These experiences have made me a natural southern cook. The Creole Relish in this bloody mary adds a spicy sweet yet a little bit tart element. It is also a phenominal addition to a homemade pizza, a burger, on grilled chicken or even with added cheese to dip your French fries in. I combine southern flavors with classic south of the boarder flavors to make amazing huevos rancheros using spicy chorizo served with a side of Creole Relish. It adds a sweet, tangy crunch to the eggs. I keep homemade relish and hot sauce it in the refrigerator at all times. If you do spend the time to make each, I guarantee you won’t just use them in this drink. Once you make your own fresh sauces you will be just as spoiled as I am and always have some on hand. Using a lemon wedge round the top of a pint glass. Turn the glass over and roll it in Slap Ya’ Mama seasoning. Combine all ingredients in a shaker. Add Ice. Shake just until combined. Pour Creole Bloody Mary into a pint glass. Garnish with pickled carrots, pickeled radishes, cucumbers and a spring of Italian parsley. Enjoy. Prepare charcoal grill. Cut tops off of onion and peel. Cut onion into eighths. Brush with olive oil and then season with salt and pepper. Grill until onions are caramelized and just starting to brown. Alternatively, roast onions in a 400-degree oven on a baking sheet. Combine all other ingredients in a food processor. Using a spatula transfer relish into a bowl. Put onions into the same food processor until finely chopped. Fold red onions into relish mixture. Let sit in the refrigerator at least over night or up to two weeks. In a blender all ingredients except salt and old bay. Heat the grapeseed oil in a large saucepan. Add the pepper mixture. Let simmer and whisk slowly until thickened. Fine Strain mixture into an airtight container. Place in refrigerator. Wash radishes and cut ends leaving half and inch stem. Cut each radish into fourths. Place radishes in a small bowl or quart sized Mason jar with a lid. Combine vinegar, sugar, salt and water in a saucepan. Bring mixture up to a boil. Cook only for a minute just until the sugar and salt dissolves. Let cool. Add chilies, garlic and ginger to the radishes. Pour the mixture over radishes. Add water if necessary to completely over radishes. Place the lid on top of the jar or plastic wrap over the bowl. Refrigerate for two days or up to two weeks stirring once a day, every day. Peel the outer skin off a pound of carrots. Using a sharp pairing knife, cut carrots lengthwise into quarters. Take off outer layer of a fennel bulb and wash throughly. Cut fennel into ¼ inch rounds. Arrange carrots and fennel into a small pyrex dish. In a small saucepan bring two cups water to a boil. Remove from heat and add salt, peppercorns, and garlic. Stir well, making sure salt dissolves completely and let cool. Add mixture to carrots. Add enough water so that the carrots and fennel are fully submerged. Cover pyrex with plastic wrap and place in the refrigerator for at least two days or up to two weeks.